On the Prospect Estate is an early Eighteen Century Great House. It is of two storeys and possesses some Palladian features. The ground floor is fortified with twenty - eight loopholes that were designed to protect it against marauding pirates and buccaneers. 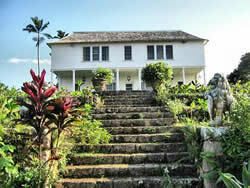 A mahogany tree in front of the house commemorates the three week stay of Sir Winston Churchill and his family in 1952.